One of the most powerful things technology allows for our students, is the ability for student voice to be heard. Many educators who embrace the use of technology in the classroom, are still very leery of talking about social media in the classroom. The negatives of social media usage between students and teachers can be disastrous. 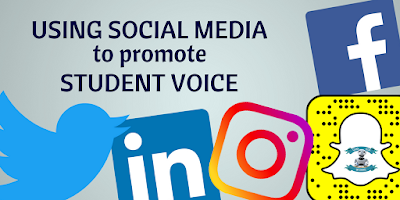 However, if used carefully by teachers, social media can be a powerful tool to not only engage our students, but to promote their student voice as well. DISCLAIMER: Students are not legally allowed to have a social media account if they are under 13 years old. We as educators should not encourage students to use Social Media apps before that age. 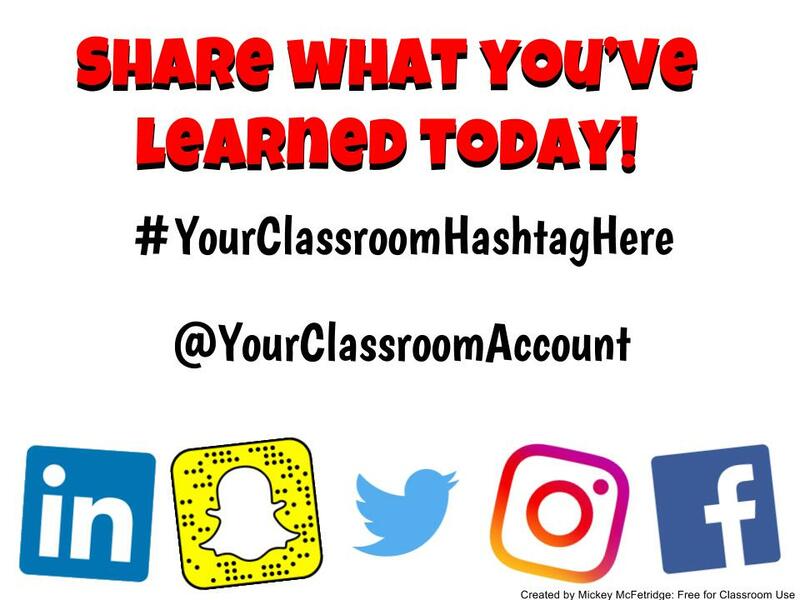 This post IS NOT suggesting that teachers connect with current students on their personal social media accounts. All discussion will be about school permitted, classroom/school accounts. What do you mean by student voice? To quote Bill Plamer from the Edutopia article Including Student Voice: "The term 'Student Voice' describes how students give their input to what happens within the school and classroom. Our desire is for students to know that their expertise, opinions and ideas are valued in all aspects of school life. Student Voice permeates all levels of our work together, from students participating in small group classroom conversations to students partnering in curriculum design or establishing school norms and policy." Why promote student learning/voice with social media? Think about the power that social media tools have brought to our society. For good or bad, people share what they are doing, buying, eating, creating, and so on. In turn others are excited to try and buy the same things that they see posts about. Making an interesting change in our world's marketplace. What about our classroom "marketplace," the marketplace of learning? If students share their learning the way they do their other daily activities, will that encourage other students to learn? I believe it will. As equally important, what about those students who don't add much into classroom conversation. This can give them a different outlet. Maybe they feel more comfortable expressing themselves through a creative Instagram post or Tweet about what happened in class as opposed to speaking in front of all of their classmates. This outlet allows for student voice to happen outside the classroom walls. How is this done with Social Media? Keep it Optional: Stay away from making posts about learning mandatory. We want this to be an authentic activity for the students, something they want to do. Many may oppose or shy away at first, but it will only take a few trendsetters to get many students on board. Keeping it optional will also avoid issues with any parents who do not want their child to participate. Open App Choice: There are so many different tools out there, and it is impossible to keep up with them all. Put the students in the driver's seat of which tool to use. Also, we know that students are into different social media tools than teachers are. Chances are if you ask a kid to post what they learned on Pinterest, they will look at you like you're crazy. 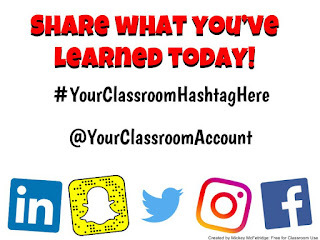 Create A Classroom Hashtag: Creating a hashtag is pretty easy, you literally just make up a phrase out of letters and numbers only and put a # in front of it! Letter casing doesn't matter, I like to capitalize each word just to make it easier to read, but you don't have to. This could even be a class activity that you allow the students to create with you! Feel free to edit and use this poster in your class! Access it by clicking Here. Give Examples: Just because your students use social media for fun, doesn't mean they will automatically know how to post in a professional manner. Give them a few examples on your classroom Twitter or Instagram account. This may seem like a scary step for many teachers to take, but these steps can help you get started on a path to get student involved in owning their learning. The benefits they will receive in learning how to use social media in a responsible manner will only improve their understanding of digital citizenship. Why not give it a try! ?